WhatsApp is working on two new tweaks to upgrade its forward feature. Calling it Forwarding Info and Frequently Forwarded, the two new changes were spotted in the works in the latest Android beta version. The two features are not enabled yet, but they should be in future beta updates. WhatsApp has reportedly also rolled out the Short Link feature to the WhatsApp Business for iPhone beta version 2.19.21.5. This feature was already available for Android users, and it has now expanded to iPhone users running the beta build of the Business app. The WhatsApp for Business recently began rolling out for iPhone users in Mexico, France, and Brazil. Facebook-owned WhatsApp recently updated its Android beta app to 2.19.80, and beta tracking website WABetaInfo reports that in the latest update, the company is working on two new features Forwarding Info and Frequent Forwarding. The two features aren’t enabled as of yet – i.e., they are disabled by default – and should arrive in the next beta updates. Forwarding Info will allow users to get more details about a forwarded message. It will let the user know how many times the message has been forwarded. This information will be available for sent messages only, because the user can navigate into Message Info only for messages he sent. Once the user forwards a message, he can tap on Message Info and know how many times a received message has been forwarded. Frequently Forwarded, on the other hand, is a label that will show up if one message has been forwarded more than four times. WhatsApp looks to add this feature to help the user to understand when a message is very popular on WhatsApp. The tracker notes that the Forwarding Info feature does not seem to be available when a message is set as Frequently Forwarded. As mentioned, there is no clarity on when these two features will be enabled, but it should arrive in future beta updates. For iPhone users, WhatsApp is now rolling out the Short Link feature with Business beta version 2.19.21.5. The feature is already available on both the regular Android and WhatsApp Business for Android apps, and is finally being tested on iOS, reports WABetaInfo again. 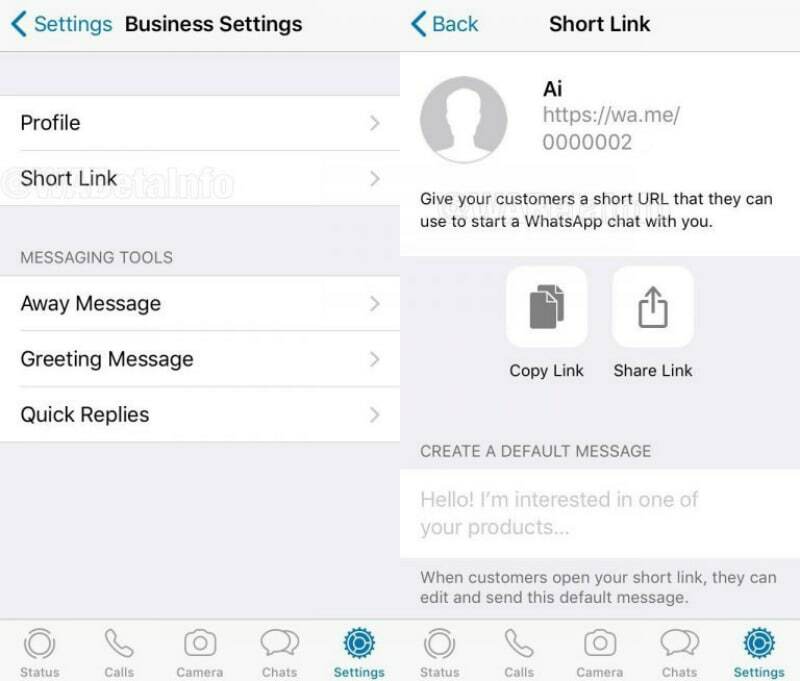 Using the new Short Link feature, the business can access a short wa.me URL to share with its customers, so that they can start a WhatsApp chat with the organisation. Once you’re on the latest version, head to Settings to find the Short Link section.